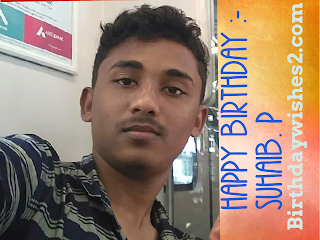 Happy birthday Dear Suhaib Pattanamkund - birthdaywishes2- Birthday wishes sms,birthday wishes images,,special birthday. Suhaib P is celebrating his 20th birthday today. He is a student and working SSF. He is living in Wandoore. 24th July 1997 is his birthday.